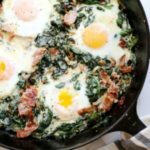 Simple Baked Eggs Recipe: Spinach Baked Eggs | From Scratch Fast - Recipes & meals from scratch for busy cooks! Most years, St. Patrick’s Day sneaks up on us unaware. Maybe it’s because I’m not Irish. Or maybe it’s because it’s in the middle of March, which always filled with muddy rain boots and way too much work. Regardless, more often than not, the 17th rolls around, and it’s only when Ella pulls out her drawings of leprechauns and rainbows from her backpack at 5pm that I realize I lost a perfectly good chance to celebrate (as I mentioned here, I’ll take any chance I can get to have fun on a weeknight). This year I’m thinking ahead. Problem is, I’m not all that crazy about stuffed cabbage and corned beef. I therefore consulted my most trusted resource: Ella. She told me without pause that I had to make green eggs and ham. Smart girl. I’m sure she was envisioning the food-colored scrambled eggs she made one year in preschool, but I thought spinach. And runny baked eggs. And prosciutto! I know, I know, it’s hardly Irish, but neither are chemically-enhanced eggs. 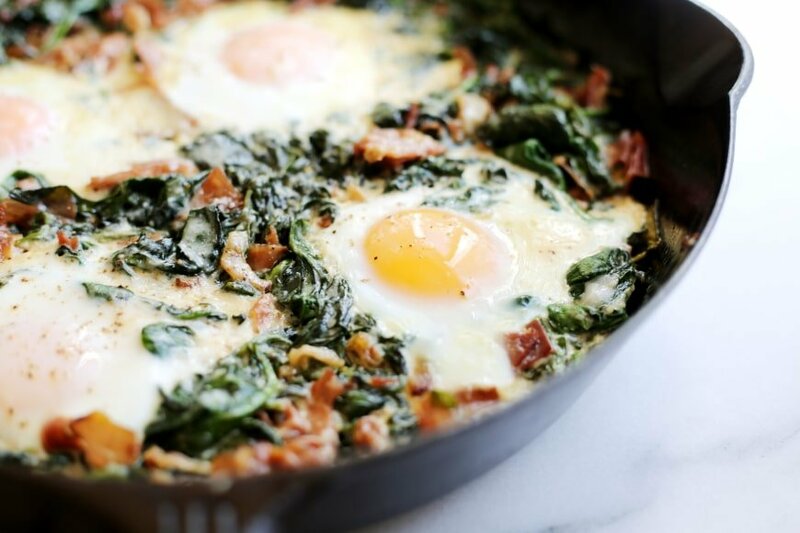 These spinach baked eggs are a quick weeknight dinner that would be just as fitting for a Sunday brunch. 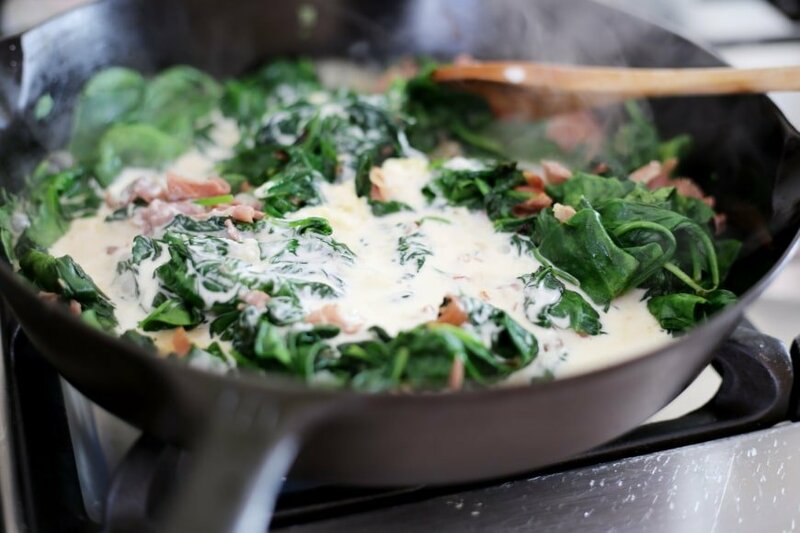 Spinach gets sautéed with prosciutto and shallots, and is then thickened with garlic cream and Parmesan. That alone would make for a killer side dish, but I transform it into dinner by cracking in some eggs, shakshuka style (check out this awesome tomato-based version). The whole thing gets popped into the oven until the egg whites are set but the yolks are still runny. 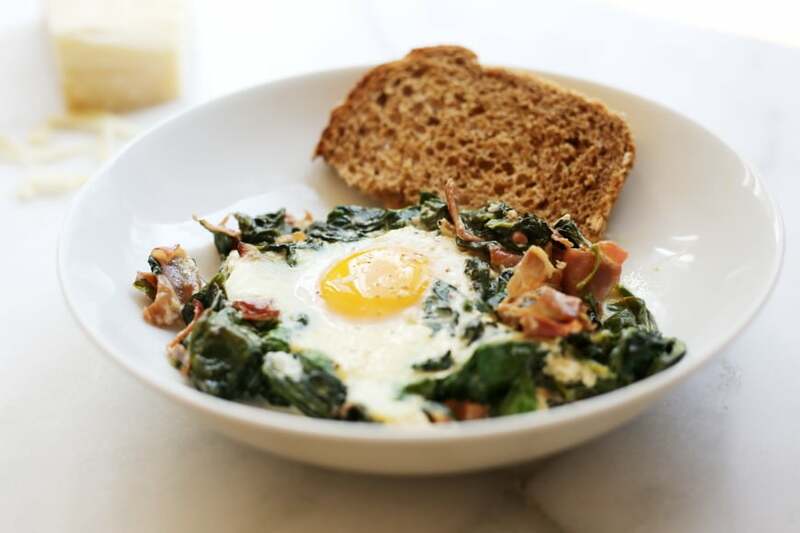 It’s a simple baked eggs recipe that I like to serve with multigrain toast (gluten-free for me), onto which we pile the spinach and mop up the yolks. Mmmm, mmm. It might not be Irish, but it’s damn tasty. After all this forethought and planning, I just realized that we’re going to be at my Dad’s retirement dinner on the 17th. That’s St. Patrick’s Day for you—as wily as a leprechaun, ready to sneak up or scamper away unaware. 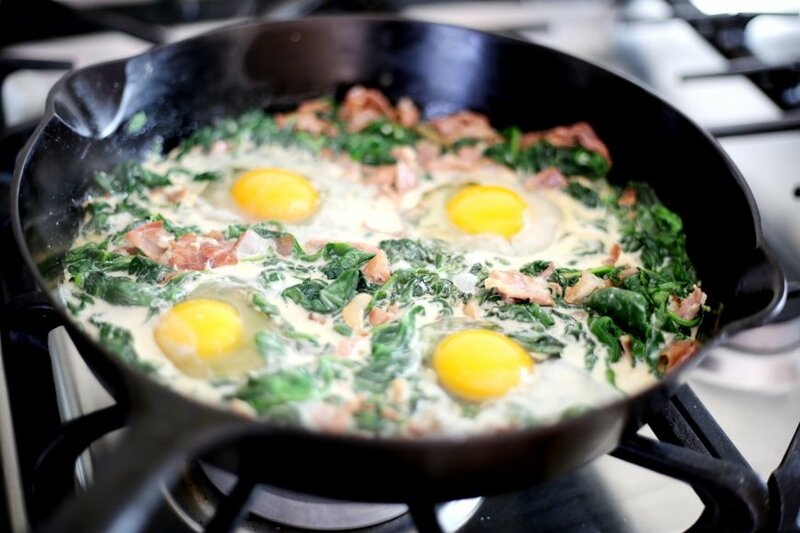 In this one-skillet meal, eggs are cooked “shakshuka-style” (that should be the name of a rap song) in a bed of creamy spinach and prosciutto until the whites are set but the yolks are still runny. 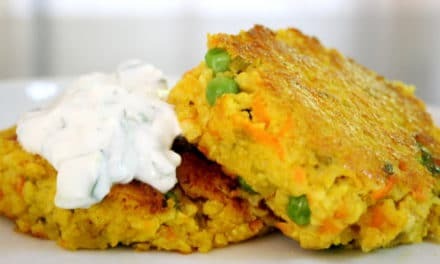 It’s a meal that’s just as fitting on the dinner table as it is for breakfast. Make sure to have some toast or bread on hand for mopping up all the goodness. **The recipe calls for 11 ounces of baby spinach, which is one large box. 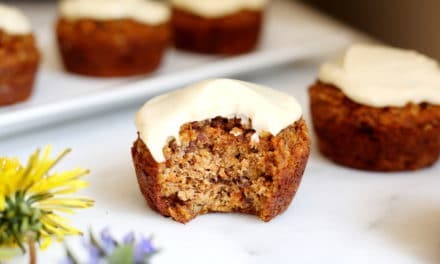 If you use 2 five-ounce boxes, cut the amount of cream to ½ cup (or add another handful or two of spinach), otherwise the result will be a bit liquidy. 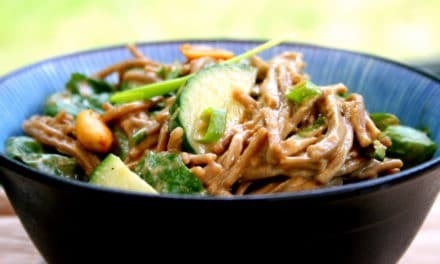 Combine the heavy cream and garlic in a small saucepan and bring to a simmer (keep your eye on it—I can’t tell you how many times my cream has boiled over!). Let simmer, stirring occasionally, 5 minutes. Heat the olive oil in a 10-12-inch skillet (preferably cast iron) over medium heat. Add the shallots, and cook, stirring occasionally, until light golden, about 2-3 minutes. Add the prosciutto and let cook 30 seconds. 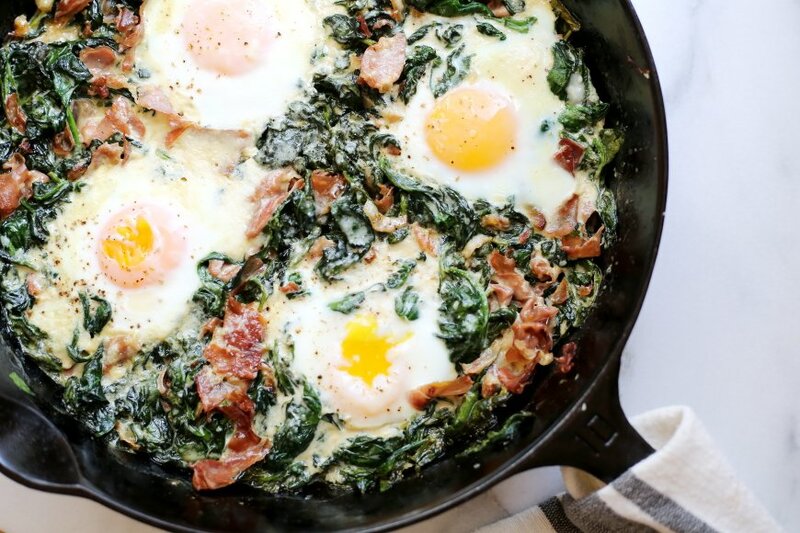 Pile in a few handfuls of spinach and let it cook down. 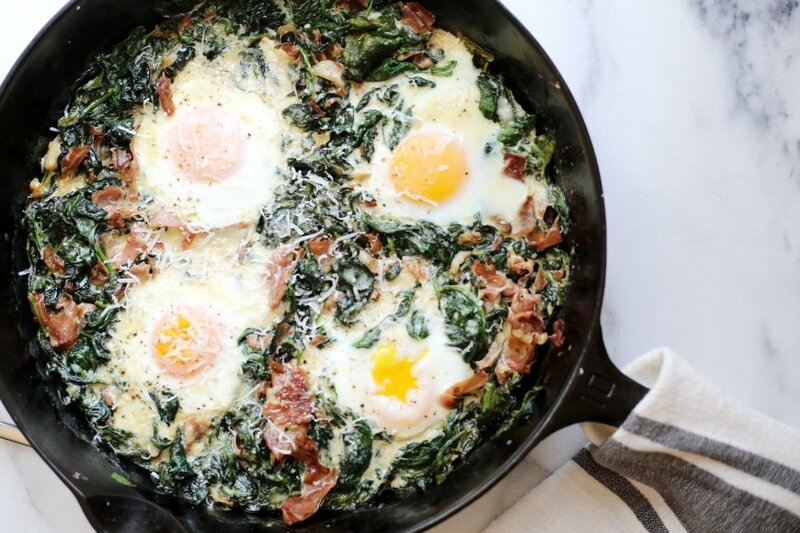 Keep adding the spinach until it’s all in the pan (it’ll look like it will never fit, but don’t worry, it will!). Cook until wilted. 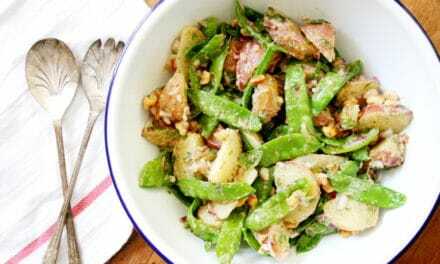 Drizzle with the lemon juice, and season with salt and pepper. Add the garlic cream and stir to coat. Spread everything into an even layer and let simmer until the cream is slightly thickened, about 2-4 minutes. Crack the eggs into small bowls or ramekins (this will make it easier to pour them into the skillet without breaking the yolks). Using a spoon, make 4 nests in the spinach. Slide an egg into each nest. Grate fresh Parmesan over top. Place the pan in the oven and bake 7-10 minutes, just until the egg whites are set but the yolks are still runny. Serve the eggs with toast for mopping everything up. Ooooh, I love me some smoky paprika! Enjoy my love!